I have created this lesson to help beginner metal guitarists who struggle with the metal gallop rhythm technique. This trademark technique of 80's heavy metal and trash metal bands was mastered by the greats of the genre. Iron Maiden, Megadeth, Metallica and Pantera are all very good examples! The rhythm itself for more advanced players seems very easy but it is really hard to get to grips with when you are just starting to learn this technique and don't understand exactly what your right hand should be doing. 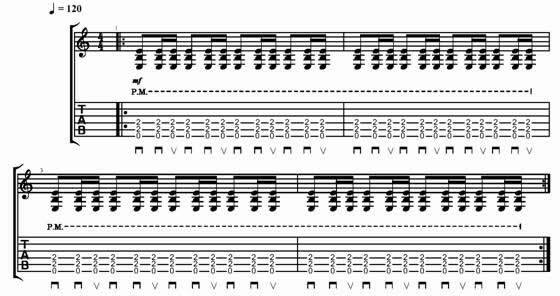 This lesson will guide you step by step on how to practice and apply gallop rhythms in practice and I am sure that very soon you will be able to use these rhythms in your own playing. The metal gallop rhythm is not about playing 8th note triplets per beat. 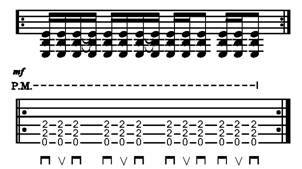 If you do this all three notes per beat are equal, which is not the case in a metal gallop. The truth is although we play three notes per beat we don't play all of these notes one after the other consistently. For an example of what I mean listen to the sound clip of the 8th note triplets below all using downstrokes for heavier sound. 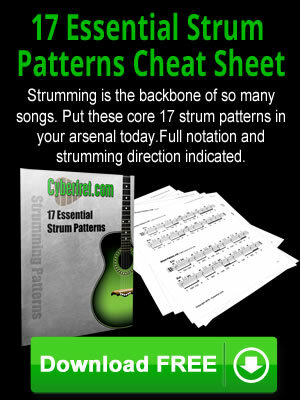 Make sure you palm mute the notes of the chords and practice with the metronome or drum machine. The metal gallop rhythm originates from the 16th note feel. To create the basic gallop we need to allocate four 16th notes per beat and tie the first two of them to create the sound of the 8th note. In the example below we have two beats with the first two 16ths tied together and the other two beats notated, which gives us the rhythm of how the gallop rhythm is played. Another cool rhythm is the 'reverse' gallop where we tie together the last two 16th notes of the beat instead of the first two. Very similar, however the gallop technique is initiated in a different place. 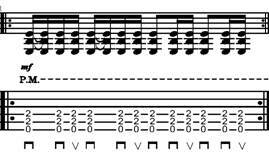 See the example below and listen to the sound sample of the gallop rhythm. Make sure that you palm mute the notes of the chord and stop any unwanted string noise by muting the top strings with your left hand. Using the very tip of your pick with a slight angle to reduce the friction while playing through the strings, is also a key aspect of executing this technique. 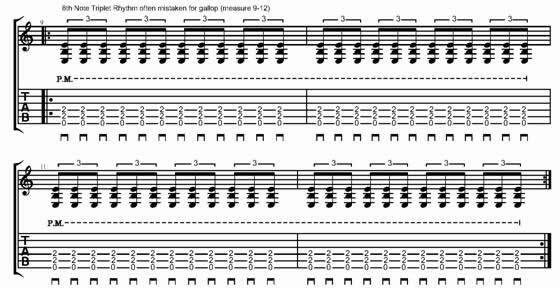 See the example below and hear the sound sample of reverse gallop rhythm. Now I want you to learn this next chord progression that we will to apply these gallop rhythm ideas. In the example below you have a mixture of two gallop rhythms that create a new cool sounding rhythm. Make sure you practice this at a slow tempo first and work your way up to speed. Go to my Wimbledon School of Guitar website where you can also download a free PDF and Guitar Pro version of this article. For free guitar tips, video tutorials, gear presentations and other free stuff make sure to sign up for my newsletter. 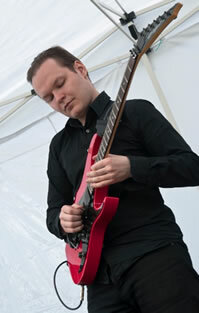 Greg X is a professional guitarist and guitar instructor based in London, UK, He specializes in 80's rock and metal as well as neoclassical metal. He is currently working on his 80's rock album featuring many accomplished musicians from USA and Europe. Greg X studied music at Goldsmiths College in London, UK.